A unique theatrical event marking the opening celebrations of the London 2012 Olympic and Paralympic Sailing events, Battle for the Winds told the story of a quest to gather the winds from across the South West to power the sailing events in July. Co-produced with Cirque Bijou, it’s the largest outdoor arts show we’ve ever worked on and was four years in the making. The tale began in April 2012, with 52 events in total across the South West culminating in three magnificent days of performance in Weymouth and Portland from July 26-28, involving 5000 artists and a total audience of 530,000 people.The grand finale on July 28 was seen by 8000 people gathered at the Live Site on Weymouth Beach. 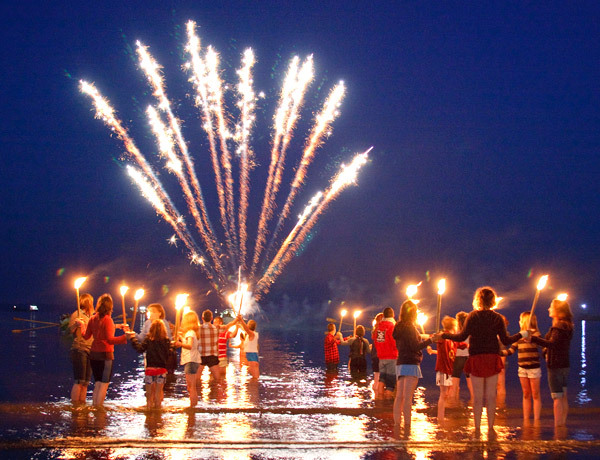 The awesome, primal spectacle of 2012 community participants wading into dark waters with flaming torches. A truly awe-inspiring spectacle and an unforgettable experience for everyone who worked on the project, Battle for the Winds will leave a legacy of new outdoor arts and creative networks across the South West. So far the events have been featured in The Guardian, on Sky News, BBC1 and ITV, in Event magazine and throughout the regional and local press, as well as news outlets across the world thanks to Reuters. The show was selected as part of the London 2012 Festival, a spectacular 12-week nationwide celebration bringing together leading artists from across the world with the very best from the UK, and was also part of Maritime Mix – London 2012 Cultural Olympiad by the Sea. Partners included Arts University College Bournemouth, Activate, Outdoor Celebratory Arts Network, Quest (South West) Co Ltd, Barnardo’s, DepARTure, Weymouth College, Diverse City and Remix. Battle for the Winds is supported by Arts Council England and South West local authorities. You can find out more about the project at battleforthewinds.com.